It was my first day at work as a Junior Associate in Mu Sigma’s Client Services team after returning to the United States – I had just wrapped up my 8-month long Columbus Program stint in Bangalore. Seated at our local office, my eyes landed on a flyer titled Consciousness 2018. I recognized the theme immediately, having learned earlier in India that at Mu Sigma, consciousness was not to be confused with spiritual awakening – it was our brand of collaborative problem solving for large organizations. I was quite excited at the possibility of being able to witness the event – it was scheduled about 6 weeks out and in my new backyard – Bentonville! Little did I know at the time, that not only would I get to experience the event in its entirety, but also contribute to the planning and action behind the scenes. Consciousness is arguably Mu Sigma’s largest annual event – it’s a summit that brings together leading industry executives and decision science practitioners from across various industries in the Fortune 500 space, under a single roof. Typically a two-day event, it creates a forum for participants to network and discuss problems faced in and around their organizations, coming up with ways to disrupt internally. While previous years’ summits have been held in ‘hotspots’ like New York, the University of Chicago, and Half Moon Bay, the choice of location for this year’s summit may have been less obvious; but as I would soon find out – it was a careful selection resulting from much thought and popular demand. Within a week of settling into Bentonville, several of us local Mu Sigma residents were invited to a kick-off meeting to walk us through the why of the event, the grand vision, and where our help would be needed most. Planning was led by a stellar 6-member committee that worked closely with several Mu Sigmans in Bangalore to transform ideas into reality, one bit at a time. 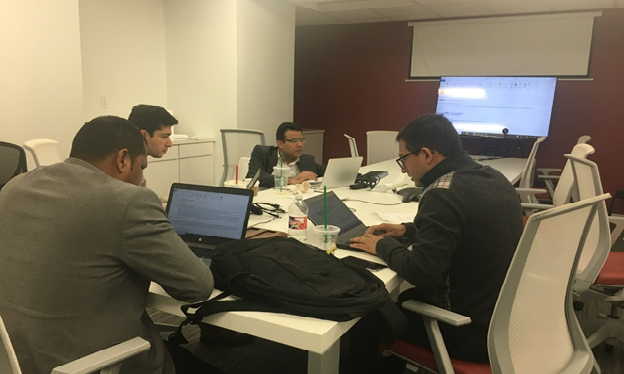 The meeting reinforced the Mu Sigma Bentonville team leadership’s commitment to arrange a high-finesse event with customer experience par excellence. During the meeting, Hemant, Mu Sigma veteran and part of the leadership recalled zeroing in on the dates and the venue, scouting through multiple choices of venue before serendipitously settling in on the 21c Museum Hotel, situated in the heart of downtown Bentonville. Once the dates of April 19-20 were firmed up, what followed next was six weeks of utter chaos. During the first two weeks, the team brainstormed to align on a common set of goals and expectations; followed by planning to a meticulous and unbelievable level of detail – from when breaks would be scheduled, to when food would be served, to the color of the table cloth, the size and dimensions of speaker platforms, seating arrangements, and hold your breath – whether a customer would be served Coca-Cola or Pepsi! Planning was no easy undertaking. The content and structure of the two-day summit was carefully designed keeping in mind the breadth and depth of our customers’ interests and expertise. The guest list was carefully constructed for the invite-only, high-profile event limiting it to executives, senior leaders, and decision makers of Fortune 500 companies. While account leaders extended personal invitations to their customers, our marketing team in Bangalore was the force behind the microsite and all official communications that were rolled out. I recall Hemant exclaiming “The Marketing team in India team did a fantastic job creating TED-ex style 3D cutouts of Consciousness!” knowing that only a week prior, members of the Marketing were holding their hands together in prayer hoping they would ship safely to Bentonville in one piece! With a week to go for the event, our Bentonville office began receiving giant boxes from India filled with various essentials from stationery to posters for the big day. Our frugal choice to develop and deliver content from India was an eye-opening experience for the high-quality, low-cost innovation that the nation delivers. The organizing committee was mapped to specific logistical items from AV to food to registration, and each of us in the 10-member team had become proficient in coordinating amongst ourselves in auto-pilot mode, or shall we say, a state of “flow”. During the last couple days, a crucial element of the summit – that of seating arrangement, was entrusted in the hands of Kannan Selvam, who had a ‘mini algorithm’ in place to dynamically allocate seats and group numbers - a necessary system to systematically accommodate last minute changes in attendees. The evening before the summit arrived quickly and we were onto our final run-through – it was fascinating to see how weeks of hard work was coming together. The nervousness in the room was palpable, but there was an even more powerful sentiment: that of genuine excitement, and assurance that we had really given it our best and were ready to embrace what was coming. What unfolded in the following two days will be remembered as the biggest and one of the most successful customer summits in the history of Mu Sigma, with over 120 customers from across the US in attendance. The agenda was well distributed between speaker presentations, panel discussions, muTalks, group dialogue sessions, fireside chats, wrapped by opening and closing remarks by our founder Dhiraj Rajaram, and emceed flawlessly by Priti Ravi. Highlights of the summit were fire-side chats and presentations by senior executives of a Fortune 500 company; paralleled by Mu Sigmans engaging the audience with cutting edge topics and trends in the world of decision sciences. I was awe-struck at various points during the two days, and recall having developed a genuine sense of pride and appreciation for what one gets to experience in Mu Sigma. The expressions of customers heading home on day two was testament to how enriching their overall experience had been. As a recent grad who is less than a year old within the company, less than a couple of months old in Bentonville, and in a new job role, I couldn’t have asked for more. I feel privileged to have been able to experience the event up close and in person, and engage actively with everyone who toiled to make Consciousness 2018 Bentonville happen. Stay tuned for the New York edition of Consciousness in October 2018!